You went on a bike ride with some friends to explore new roads in your area or simply to enjoy a nice day of fresh air, but when you got back home, annoying backside pain leaves a decidedly unpleasant memory. Why is that? Is it because of your cycling pad or the saddle? Because it can come about in different ways, there is no exact science for treatment or prevention of backside pain, so the symptoms must be analysed on a case by case basis. Nevertheless, there are a few things that you can do to prevent it. There could be several underlying reasons for this pain, some more in depth and having to do with posture that can be resolved only with an adequate biomechanical exam and a saddle position test, whereas others are caused by a mixture of heat, pressure and rubbing. The biomechanical exam is the first step toward understanding whether your position in the saddle is correct or not. Expert hands will be able to specify the exact measurements of the frame, the position of the pedals, set back or forward position of the seat/handlebar, advise you on the best saddle based on your anatomy and provide you with different measurements for each type of bike you will use. 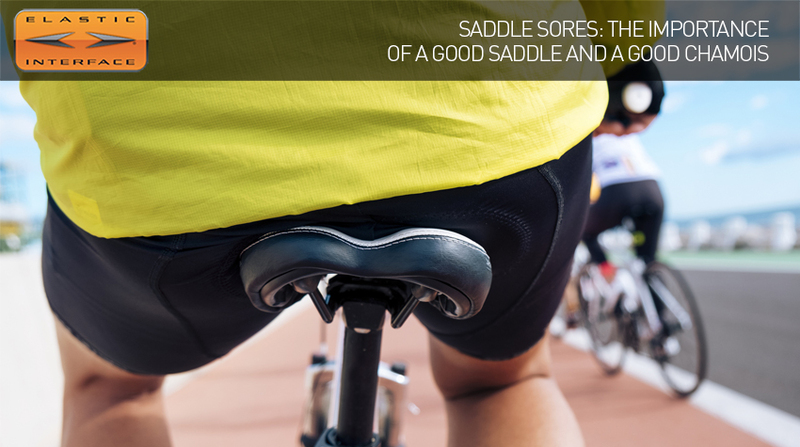 If, after all these precautions, you come back from your rides in pain, then you will also need to investigate the saddle and chamois combination. The choice of the pad suitable for the type of discipline you do is of vital importance, as we explained in this article on the subject. Just as you choose a different bike based on the type of ride you want to tackle, you must also think about wearing the right chamois in the same way. A mtb is different from a street bike from various points of view, beginning with the frame geometries and the position that each bike forces you to maintain in the saddle. Consequently, the points of contact between your backside and the saddle will be different. Whatever the reasons for your symptoms, there are a few simple things you can do to prevent them. 1. The importance of the saddle goes hand in hand with the choice of the chamois. If you intend to invest money in a saddle that suits your shape and needs, you should also be willing to invest the time to find the chamois suitable for you. Men and women should use cycling shorts designed specifically for their anatomical build and the padding should be chosen based on the type of discipline. If you are a new cycling enthusiast, or if you have just changed bike and/or saddle, it would be best to begin with distances that are initially shorter and then increase gradually. Your pelvic area needs to get used to the saddle/shorts combination and the movement generated by pedalling will certainly only increase the friction in those areas. Don’t be in a hurry and you will see how your body slowly becomes accustomed to it. After a short while, it will seem like you haven’t even been on the bike for all that time. 3. Use a chamois cream. Spreading a thin layer of cream on the chamois will reduce the friction between your skin and the shorts. Not only that, but it is also good to know that many creams have antiseptic and anti-inflammatory properties to contribute to reducing the possible formation of annoying bacteria and rash breakouts. 4. Hygiene, first and foremost. Get in the good habit of always washing before and after every ride, with special attention to your delicate areas in order to remove sweat and any trace of chamois cream. Also, just as you would put on clean undergarments every morning, always wear washed cycling pants for your rides. No one likes to spend hours sitting on rancid sweat. If you are not sure how to wash your chamois, you can follow these simple instructions. 5. The importance of rest. As with anything, it takes time and if you feel pain, there is nothing wrong with that. It is your body sending you warning signals and asking you for a bit of extra care and attention. Cycling is an endurance sport where the same motion is repeated countless times. It is therefore normal that even the smallest pain or discomfort is amplified. Allowing the right amount of rest will guarantee optimum recovery so you can get back in the saddle and perform better than ever. Cycling entirely changes weight distribution, muscle contraction and the posture of the spinal column, often maintaining the neck and back in an unnatural position. Fortunately, the human body is extremely versatile and, thanks to a few precautions in terms of positioning, gear and accessories, we can reduce discomfort to a minimum and fully enjoy every ride.